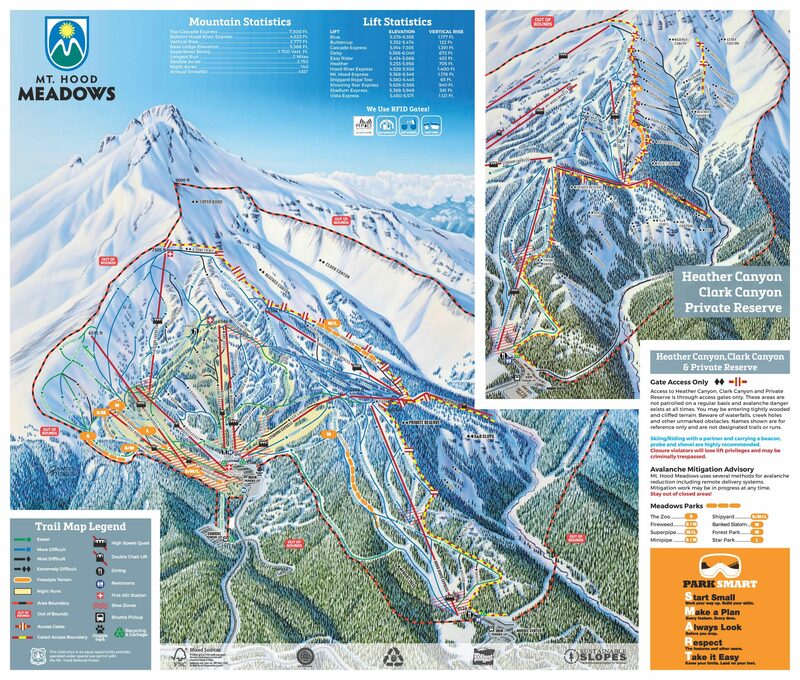 Trip Report: Skiing Mt Hood Meadows - Ski. Play. Live. Disclaimer- this was written last season when Utah had snow. Ryan shook his head. “Why would you want to go to Portland when we have great snow in Utah?” he asked. My boyfriend doesn’t get out much and apparently he doesn’t follow the weather. 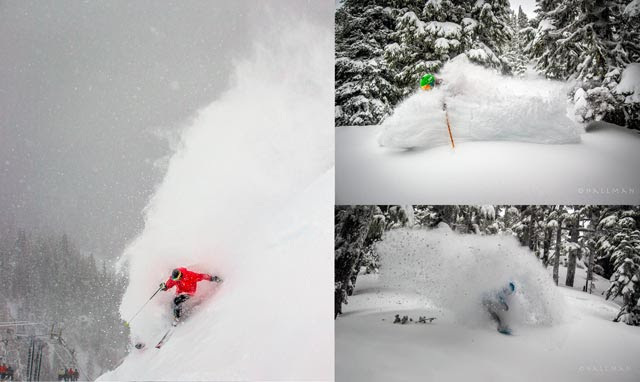 It’s been snowing in Mt Hood Meadows; a lot. The snowpack at the Oregon resort has surpassed 200 percent of normal. You might wager that Hood has gotten snow at least three days a week, every week this season. The reports of massive dumps began rolling in around Christmas time and kept on rolling. Ryan has a point, though. It is such a challenging choice to travel away from Utah in the winter. It’s often not as sweet someplace else. Utah is known for the driest, lightest snow on the planet and even on a mediocre day it beats skiing “Sierra Cement”. Those coastal resorts usually see a mix of rain and snow which can wreak havoc on a ski slope. Hence, I’ve never gone to the Pacific Northwest for a ski vacation. But there’s something to be said for a change of scenery. As yet another storm moved through the PNW, the timing just seemed right. I landed in the middle of freezing rain and an ice storm that closed the highway to Hood River. As people around me commented about how this was the “worst winter” they’ve seen, my anticipation escalated. Powder in the mountains! But… WTH is freezing rain? I stepped off the MAX lightrail train from PDX to Chinatown wearing my YakTrax for traction and the hipster dude next to me nodded, “You came prepared.” I solidly placed my boot into a pile slush that sat atop black ice. Yep, that’s what freezing rain is. 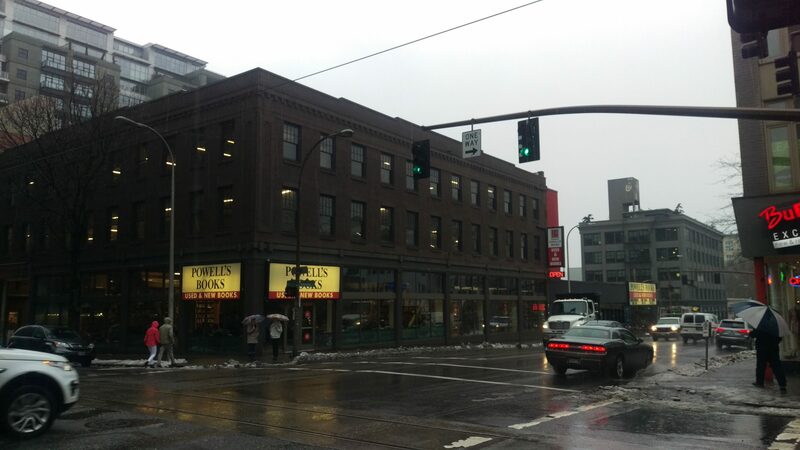 The Portland rain was heavy and wet and dank as I walked the few blocks from the commuter rail to the hotel. In Utah, we’re good with a down puffy and knit hat; in the PNW, Gore-Tex is king. Nothing is spared without an umbrella. The rain drenched the top of my boot bag and Eagle Creek carry-on as I wheeled it down the few blocks to my hotel. My Utah mind had a hard time wrapping my head around rain in the middle of winter. 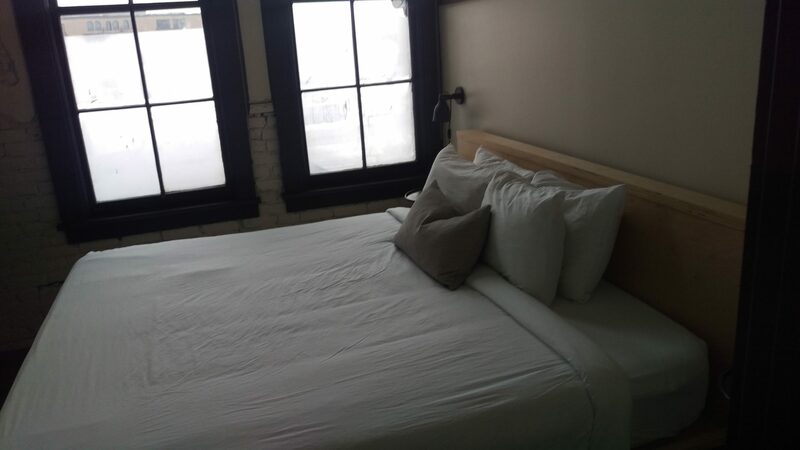 I was now stranded in Portland at the uber hipster, boutiquey Society Hotel (no TVs in the rooms which are powered by solar, but a public coffee bar in the lobby for live podcasters). The vintage feel of the mahogany floors, vaulted ceiling and single check-in stand created a timeless calm to the chaotic weather outside. The minimalist lodging was built in 1881 to house sailors who stopped into port then later offered shelter to Japanese immigrants, gypsies and the homeless through the years. It eventually became this funky urban spot with a rooftop garden that offered beds to backpackers and honeymooners alike. After a restful night (courtesy of the provided earplugs), I threw open the curtains. Rain. Then the email from the Mt Hood folks- Just in case you hadn’t heard, all of the roads through the Gorge are shut down. Wait, I came all this way and I’m not going to ski?? 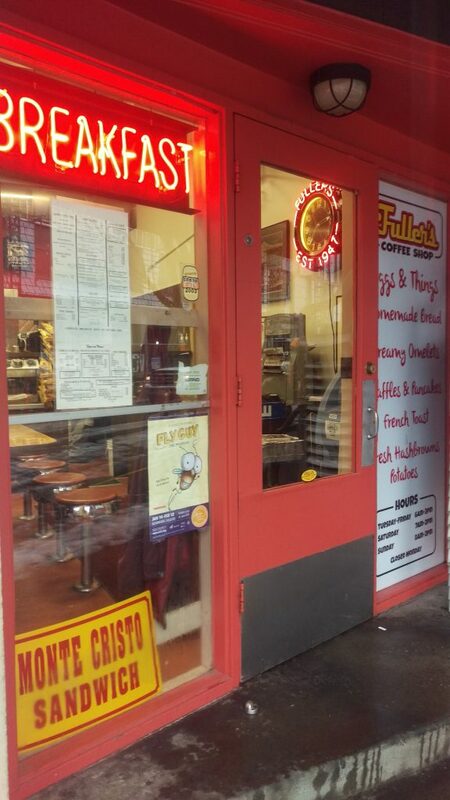 I walked myself to a delicious breakfast diner called Fuller’s to contemplate my next move. The communal place consists of two, horseshoe-shaped counters- no tables or booths- that serves up hashbrowns and bacon grilled to perfection. I would find my way to the slopes even if I had to bum a ride off the guy next to me, Craigslist or bus. The waitress mentioned ODOT operates a carpool resource called drivelessconnect.com. There is also a Facebook Ride Share group. Dave Tragethon to the rescue! The resort’s head of PR picked me up on his way to work and drove us along the old-school ski road (Hwy 26). The rain quickly turned to light snow. A couple of hours later I had my Atomic ski gear from the mountain’s pro shop and was ready to rock the conditions which ranged from soft blower to coral reef, aka dust on corrugated crust. The overcast, white-out visibility prevented me from taking in those Willamette River Valley views. Not only that but the clouds socked us in to the point of disorientation and I had no clue where to go. Local ski instructor Katie Kadlub, was my hand holder. The layout of the hill made me feel like I was in different spots but that was due to her guidance. We actually kept circling back around. Funny, I expected a mom and pop place but Mt Hood skis like a big mountain. Though the resort has a base elevation of 3,600 feet, it has a vertical of 3,700 feet, an average base of 100+ inches on mostly intermediate and advanced trails. They’ve got steeps, bowls, tons of PNW trees and gentle groomers back to the base. And when you hit it right, the snow builds and builds. After a quick lunch inside the South Lodge at the Alpenstube, we were back out for laps in Heather Canyon. The snow accumulated during the morning and through lunch making the hardpack beneath nonexistent. With legs on fire and a Cheshire cat grin, we clinked beer mugs for the ‘Stube apres scene and I waited for Dave to get off work. He was my ride to the “Lodge Suite” at Cooper Spur Mountain Resort just around the bend from Meadows. The pet-friendly, cabin-style room had a giant log bed and flatscreen. All you need after a hard day of lapping empty trails. I downed a hearty filet and chocolate torte at their Crooked Tree Tavern I rushed to bed. Cooper has its own attractions including a Nordic Center but most residents do their serious alpining at Meadows. There wasn’t a lot going on this evening. The volcanic Mt Hood itself is home to six ski areas totaling over 4600 acres: Timberline, Mount Hood Meadows, Ski Bowl, Cooper Spur, Snow Bunny, and Summit. Though most are done for the season, Meadows closes on May 6 and you will still be able to ski through the summer at Timberline if you’d rather make turns than paddle in the Columbia River Gorge. The snow continued into the night, clearing by morning so that we had access to the experts only gates into Private Reserve and S&R Cliffs. PNW skiing? Now, we were talking! Nearly a foot swirled around us with no one else to poach it. Interstate 84 was still closed because of the ice storm so we danced among the glades and mini-rockchutes, lapping the empty lift mazes until it was time to fly home. At this point there are only a few resorts still doing winter – Snowbird, Utah, Mammoth Mountain, Calif., Arapahoe Basin, Colo. and Blackcomb, B.C.. There’s enough snow in Mt Hood Meadows to keep you skiing into August but with big plans in the works for their upcoming 50th Anniversary celebration, they’ll let Timberline do the honors. The anniversary website has already launched. The list of events and deals is growing by the day. Some of the plans include a special 50 time pass (limit 50) as well as special midweek $50 lift ticket and learn to ski or snowboard packages (limit 50 each). There’s no better time than next season to experience Mt Hood, Oregon and the Pacific Northwest. Pingback: It's Beer Thirty In Oregon - Ski. Play. Live.